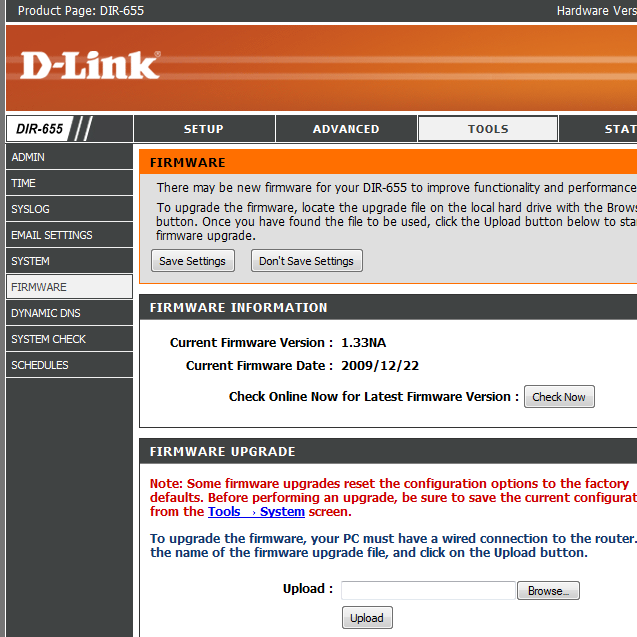 Update: Firmware 1.32NA Build 09 BETA fixes this for most people. A few people have been experiencing trouble with their DIR-655 routers locking up after about 3-4 days with web browsing slowly going downhill until the lockup during that time, I experienced the same thing. I realised that I had SPI enabled, which in the past I haven’t had enabled, I disabled it and so far I haven’t had any lockups, it appears the SPI is overloading my router after a few days which to me is surprising for such a supposedly powerful router. If you experience the lockups try disabling SPI, the other more common solution to do is to disable DNS relay, I’m not sure why this would be causing the router to lockup but it appears to be something to do with the latest firmware, hopefully they fix this in future firmwares.